We returned last weekend after two weeks in the South Island. Since our return we have experienced an advance by winter and the week has been cold, wet and windy. Summer will fight to continue its presence but will lose out. Today it is windy and cold and I haven’t been enticed to the river to fish. Guest speaker is Simon Stewart. Topic is his findings about the food web in Lake Taupo and the repercussions on trout. Good news this morning (Thursday 12/4/18) we have begun channel work on the Tongariro. As you cross SH1 you will see the bund and soon the reshaped channel. 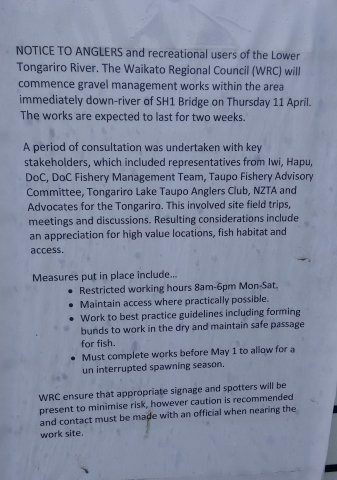 There has been a 2 significant gravel beds/islands at the SH1 Bridge and Kohineheke Reserve that have been building (at least in the 3 years since I have been at WRC) for a number of years. These two areas have been an underlying concern to our engineers and more recently the completed scheme review indicated that the elevated level of the river at this point is compromising our freeboard for the stop bank (that is the stop bank will still contain flood waters the 600mm freeboard is partially compromised). WRC staff have been working through the process with Turangitukua over the last 2 years to agree on the approach to these issues. The environmental Committee of Turangitukua recently agreed to allow WRC to move the islands. We are to work with individual whanau to determine how we manage any issues on their section of the river (after the Environment Committee has given approval). At this stage we are working with Ngaiterangi Smallman on the two current gravel islands and have found him very receptive. We are going to reinstate the eroded area of Kohineheke Reserve as a part of this process. We have agreed to work with “the collective Tongariro Awa whanau (Ngati Turangitukua Hapu) to develop a Whole Awa strategy that recognises that The Tongariro Awa is a taonga, a living entity.” This will be a huge benefit to help direct WRC in their future management of the lower Tongariro River to achieve collective outcomes. I am very keen to offer what support we can to achieve this. And whanau have also requested we “engage in further work undertaking removal of weeds and pest and full restoration of the riparian area” which I completely endorse and support. I feel we definitely have some common goals in this area and today is a big step to achieve outcomes that are good for the river, hapu and all other parties. In the future WRC will enter into discussions much earlier now that we have a process and be a little earlier in the season when completing these works in the future. 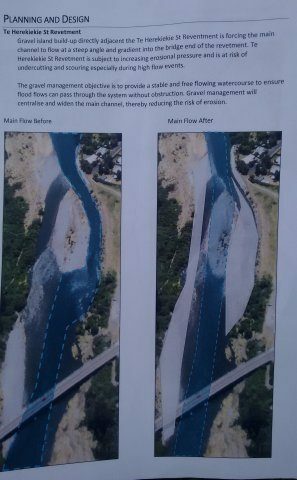 WRC river manager explained to me today that DOC Taupo Fishery Facebook have highlighted the river work. In the absence of a fishing report from me I found the reports on this site interesting. The NZ Herald in it Sunday supplement travel March 25 carried a Sponsored article from Destination Great Lake Taupo which featured Chris and Kathy Johnston’s 5 favourite e-biking trails around Taupo. The Tongariro River Trail is a great introduction to e-biking off-road. The trail is a return trip following the banks of the world-famous trout fishing river up to Red Hut. The trail will lead you through native forest, past clear fishing pools and over bridges that offer stunning views of the river from above. A great stopover is the Tongariro National Trout Centre where you’ll find a visitor centre and trout fishing museum, a freshwater aquarium and an underwater viewing tank. Take the pleasant walk around the centre and spend some time watching the anglers down in the river – this is a popular fishing spot – before hopping back on your bikes and completing the loop trail back to Turangi. I have just returned from a fortnight in Wanaka and the value of walking /cycling tracks can be seen as immense. The value of tourism is there to be seen with cycling and walking being an important part of the tourist opportunity. The Advocates For The Tongariro River are pleased to have been responsible for the building of the Tongariro River Trail (TRT) which we have now passed to Bike Taupo. I don’t have an e-bike but thoroughly enjoy a walk or ride around the TRT. We have a planting day planned next Friday. If you know of anyone who is likely to be a keen helper they could arrive around 8am to assist with putting plants out? Let me know if so and how many.